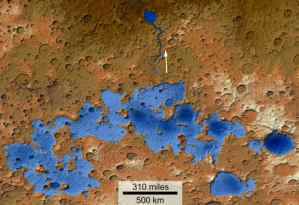 See, this actual picture of Mars proves that there is water there! And there are little green men swimming in it too. See? Right there by that one sort of darkish-coloured crater? Visit NASA's astronomy photo of the day site for the more technical explanation of this picture, but trust me: Those Martians are water-skiing up there!